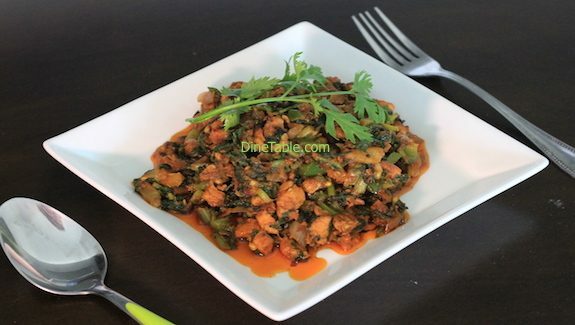 Palak Chicken is a healthy chicken treat for Kids and your guest. At times we find difficult to feed green leaves to kids and sometimes even elders, right? 😉 So here is a solution. Here I have used boneless chicken. You can use chicken with bones also. I have stir fried palak and mixed the chicken cooked separately with ginger & garlic paste with some spices. That’s it. It tastes really different and is healthy too. Add more palak to increase the nutrition contents. 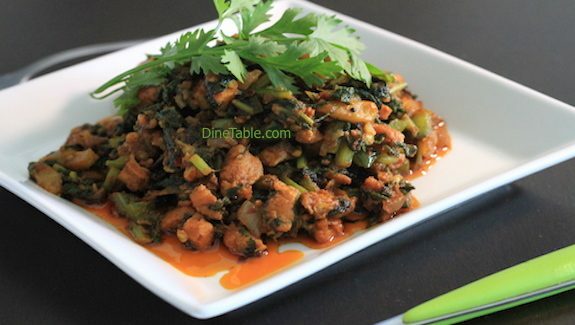 Both chicken and palak are high in proteins. So if you make the recipe with less oil its a good recipe for those dieting. Talking about nutrition facts of Palak (Spinach) they contains vitamin K, fiber, phosphorus, and thiamine. Most of the calories in palak come from protein and carbohydrates. Heat 2 pans. we can do cooking of palak and chicken in parallel. In one pan splutter mustard seeds in oil. Then shallow fry onion and then add coconut and chilli flakes. Once this is fried add chopped palak and stir fry. No need to add salt here as palak has inbuilt salt. In another pan mix all ingredients mentioned for cooking chicken and stir well. Allow chicken to cook until the palak is done in another pan (Above step). No need to add extra water in chicken as chicken itself will have required water. Open the lid and evaporate excess water so that the chicken mixture becomes dry. 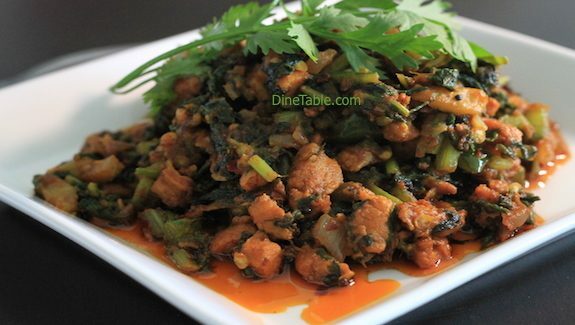 Once palak is stir fried, add cooked chicken to it and allow the gravy to dry. If you prefer to have a watery palak chicken add some boiling water. Tip: For garnishing add a spoon of fresh coconut oil on top and switch off the flame. This is purely optional. But let me just tell you that this adds a heavenly taste to your curry.